Developed by Bayrocket Games, Super Space Boy is an easy-to-play platform-jumper for kids. 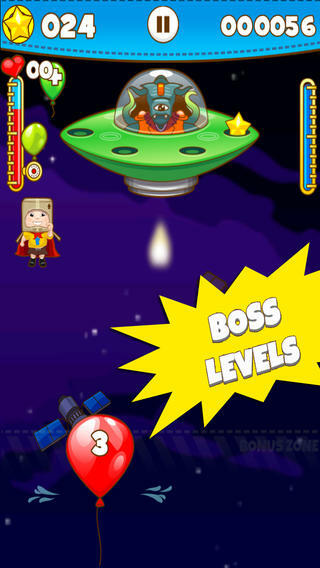 Featuring similar game mechanics to Doodle Jump, Super Space Boy features a young boy in a space suit. Gravity still exists in space in this game, and if you don’t position a big red balloon beneath Super Space Boy – he’ll fall down to his doom. To play Super Space Boy, you simply tap and hold the balloon and then you can move it around the screen. Position the balloon beneath the boy so he can bounce back up after he falls. Whilst you direct your character skyward, you also need to use the balloon to collect stars and green ‘+’ balloons which give you more energy to keep your balloon inflated. If you let the balloon “run out of gas” the level will end. 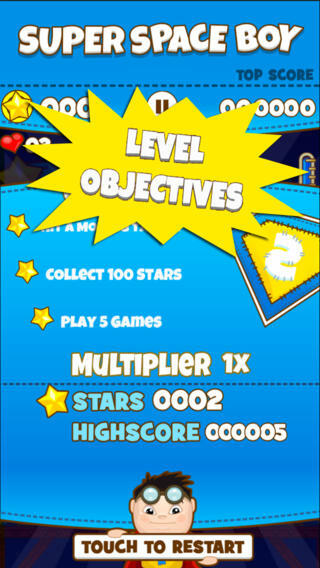 Each level has different objectives, such as a certain number of stars to collect, and increases with difficulty as you progress through the game. At the end of each level is a boss (invariably an alien in a spaceship), and you need to use your character to take out all the stars on the UFO to beat the stage. The game features a shop lets you buy upgrades for various abilities, including a star magnet which attracts stars to you, a super rocket, iron boy blasters and extra balloon bounces. These purchases use stars which are earned in game, but can also be purchased. Super Space Boy features bright and original graphics but a very similar style of gameplay to many other titles in the same genre. As a free download, it’s definitely worth a try and will appeal to younger children. Super Space Boy requires iOS 5.0 or later. Compatible with iPhone, iPad, and iPod touch. This app is optimized for iPhone 5. Follow Tapscape for all the best iPhone games for kids.